Yes I'm still alive, and really I have been meaning to blog but everyday it would just get pushed aside to all the other things that have been going on. 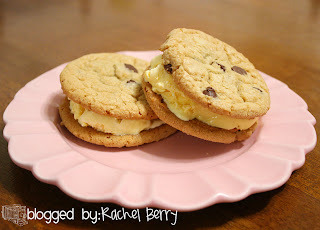 These Ice Cream Cookies came about as I was making cookies for FHE and decided to throw some ice cream in the middle and all I can say is YUM-O!!! Especially with nice fresh baked cookies..
Just let them cool and plop some ice cream in the middle and your all set, the kids wanted 2nd's and 3rd's but we figured 1 was good. We have had these 2 times in the last week.. I know my thighs will be screaming at me come the end of this holiday season. Side note: I used my medium Pampered Chef Scoop for these cookies they were nice and big! I pull these out of the oven when they are lightly browned around the bottom of the cookie. And since every oven bakes different you may have to bake a little less or more. Just keep an eye on them cause even slightly over baking them will make them way too crunchy. And stay tuned as I have enlisted the help of my Husband in revamping our TV hutch, okay really he will be doing most of it, but I'll be the painter... I'll tell you that it involves replacing the screen door with an old door that I got for free. Hopefully it will for the most part done within the next few days..... No pressure Lloyd! ;) I'll post pics for sure! I just hope it looks like it does in my head! Oh and can I just tell you how excited I am for Mama Mia to be coming out on DVD on the 16th! Hello early Christmas present to me!!! Sounds like you are having a busy, busy Dec already! Loved your Turkey shirts...wish I had seen them before Thanksgiving. 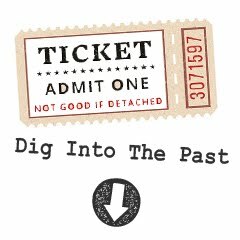 Also enjoyed looking back through your blog while listening to your vintage Christmas tunes. Can't wait to see the rest!! Love the sparkly deer!! Hooray Pampered Chef! I am a consultant, and LOVE when other people love our products. I love your theme of Santa. There seems to be a trend in my town to not believe in Santa and not letting their Kids believe as well. You'll have to check out my latest post on this issue. Can't wait to see the rest of the tree. What a pretty tree...still have to get mine up...ahh! I am glad to see you DIDN'T fall of the face of the earth. Can't wait to try those cookies! I'm wondering how you accomplish everything you do?! This cookies look very yummy too. I'm impressed! I ran out of steam about October 1st LOL! Rachel I have the same recipie only I use all shortening instead of butter. Its funny how variations of the same cookie are out there. I made them the other day for our cookie exchange. Yum Yum. Hurray for the Holidays! yeah, not reading this one too in depth. . the 16 pounds I've put on since August of 07 is NOT going to be added to!!!! help me. . treadmill, here I come! 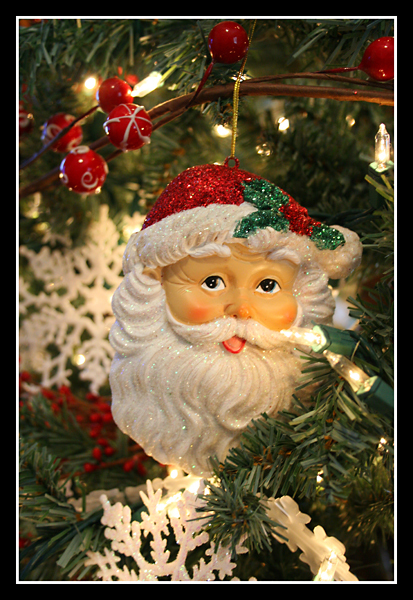 what a fun idea...i totally just want the kids to get the tree decorated and quit fighting..i never think of realy fun little treats. i guess that's not my forte! i think i'll give it a shot tonight! ♥ Cute tree! I still love the big red bells!!! Glad you're back, I missed seeing what you had been up to. The Christmas tree looks fabulous, I mean really fab! Thanks so much for the recipe!!! Love the close-ups of the tree. Ok am I going to have to put you on my list of inactives to visit? In case you check this tonight, its Brooklyns bday on Wed, wondering if you could drop Brinley off after school? Hope you are doing ok, I'll chat with you tomorrow! YUMMO! The tree looks great! 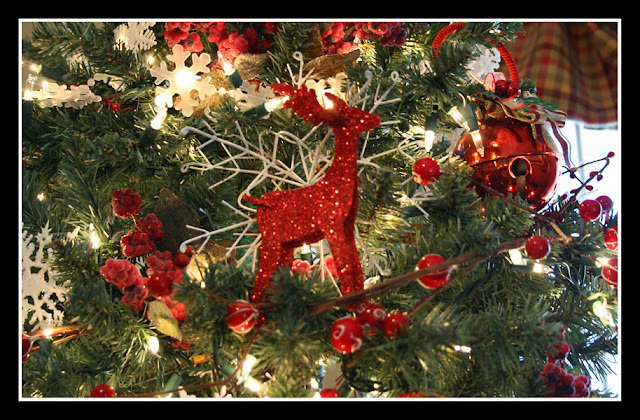 I love those red sparkley reindeer. Very cute! And i could go for some good chocolate chip cookies right now! oh my! what a cute blog you have! Thanks for the drool worthy cookie pics. I am now going to have cookies for breakfast..yum!! Those cookies look DELICIOUS! And your tree looks amazing! I love the ornaments! Such a busy time of the year?? ?Oh my goodness those cookie sandwiches are divine..do they taste as good as they look???Wow!!! YUM! The ice cream cookies look EVIL! YUMMY! I love your tree - its looks beautiful - I love the red glittery reindeer. So pretty. I hope everyone is feeling better and you start to get some rest. Yummy!Your cookies look good! I love your Christmas decorations too! You have inspired me to get off the computer and go make cookies. It's ok to be behind, who isn't this time of year? Beautiful tree, we are headed out Sunday! You had to post the pictures of the ice cream cookies, didn't you? I think we'll just skip dinner and have sandwiches instead....no one needs to know they are ice cream and cookies. :) Love your tree! BEAUTIFUL shot of your tree!!! 3 words...Hyland's Teething Tablets. Homeopathic...you cannot OD on them (my oldest climbed up &ate 1/2 bottle at 18 months). Whole Foods, Target, Walmart, any natural foods store. Heaven sent stuff.